As part of Panamania, Théâtre français de Toronto is presenting the Toronto premiere of a fantastic physical theatre piece called LEO. 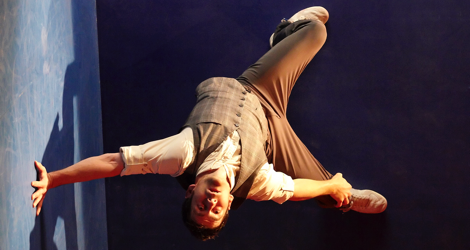 The show, which debuted to much acclaim at the Edinburgh Festival in 2011, has been touring the world ever since wowing audiences with its illusion of an ordinary man waiting in a room where the laws of gravity are suddenly suspended. The conception, the illusion and the physical performance of Julian Schulz as the Man are brilliant. The show loses impact only in its final quarter where the addition of video projection diminishes the purity of the conception. In LEO the set-up is much simpler so that the performer can explore the implications of loss of gravity to a greater extent. On stage we see a large screen stage right and the set stage left. On the set designed by Flavia Hevia we see only adjoining three sides of what we assume is a cubical room. The back wall is dark blue, the floor of the set is light blue and the side wall is bright red. A video camera, unseen by the audience, is mounted on its side to frame the image so that the red wall becomes the floor and the light blue floor becomes a wall. The resulting image on the large screen is rotated 90º clockwise in relation to the set. Throughout the show we are entranced by the illusion of reality shown on the video as much as by the incredible strength and precision of mime that Julian Schwarz uses to create the illusion while on the set. He is able to walk along the floor in the video while really sliding his shoulder along the floor of his set and moving his feet on the set wall. His strength can be seen when he creates the illusion of standing on the floor in the video with his hand against the wall, when in reality his has his feet on the wall and is supporting his weight on his arm on the floor of his set. most delicious part of the show is the Man’s gradual discovery first, that the laws of gravity no longer apply in the room, and second, his taking advantage of benefits that a gravity-free world offers. When the light hanging above him in the video (i.e. protruding parallel to the floor of his set) begins to malfunction, he tries to see how he can reach it. His suitcase does not provide enough of a boost but then he finds he can crawl up the side of the wall and use his hat that is somehow stuck to the wall as a stepping stone to get to the light. In another sequence, the Man finds that his suitcase functions as a kind of radio that plays a different style of music whenever it is opened. He grooves along to Latin American music but when the tune suddenly shifts to Indian music he flies up into the top corner of the video, his legs in the lotus position. The highlight of this section is when the suitcase plays the 1932 song “I’ve Got the World on a String” as sung by Frank Sinatra and the Man launches into joyful acrobatic demonstration of show dancing while suspended in mid-air. In a charming development of whimsy, the Man discovers a piece of chalk in the suitcase and enlivens the blank world of the room by drawing a café scene on the back wall. Here he can sit on the two-dimensional chair he has drawn or hang from a two-dimensional shelf. A feeling of melancholy underlying the action surfaces when we see that he waits so long for another person to arrive that his hand-drawn glass goes from full to empty as well as the hand-drawn bottle. Up to this point the show has relied solely on the ingenuity of the creator Tobias Wegner, his director Daniel Brière and the unbelievable mastery and grace of Julian Schwarz. It is, therefore, very unfortunate that the director decides to add the element of video projection to the show which suddenly altered our appreciation of the action for the worse. What had depended entirely on mental creativity and physical ability is undermined by video trickery. Showing that the room becomes flooded with water does allow Schwarz to mime swimming in various strokes and even indulging in solo synchronized swimming. The negative side is that the alteration of what we see in the video comes not just from Schwarz but from animation superimposed on his actions. The worst example is when strobe-like ghost figures are projected on his actions to such an extent that it is difficult to see on the video what Schwarz is actually doing. The only way to enjoy this final section is by shifting attention fully to the set which Schwarz begins to use in a host of new ways. Without this intrusion of video, LEO would be a clear five-star show. The first three-fourths of the show are still so visually dazzling and conceptually imaginative that no one should miss them. From all the unrestrained laughter around me, the show clearly pleases both children and adults. The creators are obviously happy with the show the way it is, but it seems quite evident that it would make a much stronger impact if the video-animated section were simply omitted. Fred Astaire used no animation to create the classic routine that inspired Wegner, and Wegner and Brière should have followed his lead in their otherwise thoroughly delightful homage and exploration of that scene. Photos: (from top) Julian Schwarz as Leo; Julian Schwarz as Leo. ©2015 Andy Phillipson.